The functions of computer labs have changed over the years from general computer instruction to technology labs with intensive program-specific software. While classes were once taught in computer labs to instruct students in the use of basic computing tasks such as word and data processing, computer labs are now used by students for program-specific software for technology driven applications. Some of these programs include animation, graphic design, programming, architectural drafting, and industrial design. The list of available programs and their range of functions has also greatly increased over the past few years and computer labs are now often used by students for their powerful and expensive program-specific software. Because of the increased diversity in terms of their functions, computer labs in schools may no longer be referred to as simply computer labs. Computer labs may employ new titles to describe the specific functions of each lab, such as a graphics or animation Lab, as different labs are directed towards accomplishing particular purposes. Computer labs are rooms that feature a number of physical computers that are available for various or specified uses, and often have other hardware like printers that users may need. Computer labs are more akin to classrooms in terms of how they are set up, but labs may or may not be independent of any actual classes, meaning that classes are not necessarily held in a computer lab. Computer lab design is a key feature for these kinds of labs. Four popular designs are rows, perimeter, back-to-back, and u-shaped layouts. Rows consist of computers being placed in a line with all of the students facing the front of the room, while a perimeter layout lines the wall of the lab with workstations. In a perimeter layout often tables are placed in the center of the room for a group meeting space. Two other popular designs are back-to-back workstations and a U-shaped design. One benefit of a back-to-back layout is that these stations center panels, power access, and cable management, so they are a cost efficient design. The U-Shaped layout can maximize room space. Interior Concepts has over twenty years of experiencing designing space-efficient workstations that smoothly integrate technology for the greatest number of students. IT departments also appreciate the Chase™ Wire Management System because of its ability to help simplify equipment connections and hide wires and cables. 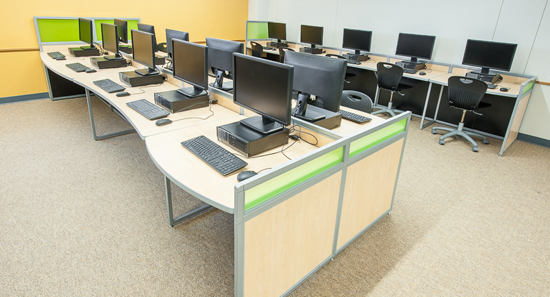 If you are designing a computer lab and need the right computer lab furniture, contact Interior Concepts for a free, no-obligation quote.